El Blok may be nearly brand-new, but it’s not out of the question that you’ve already heard of it. 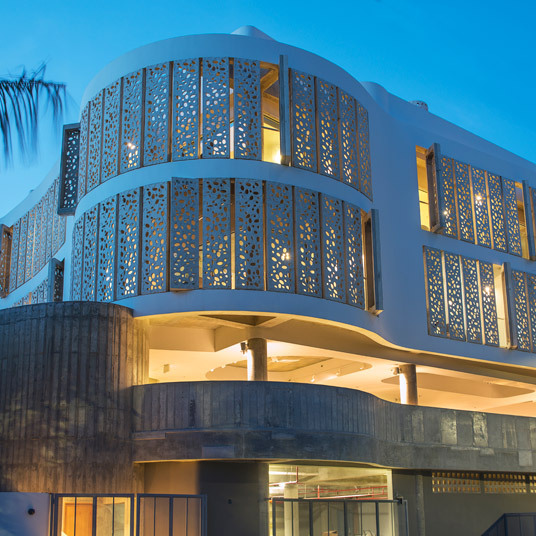 Since opening in 2014, this modernist boutique hotel, located on the Puerto Rican Island of Vieques, has appeared in bold-faced text on every “hot list” and “best new hotels” round-up imaginable. And with good reason. El Blok has a lot going for it — a fresh, stylish spin on the Caribbean getaway, a James Beard Award semifinalist chef in the kitchen, and an idyllic location that’s relatively accessible but feels exotic, even far-flung, despite its location just off the coast of mainland Puerto Rico. Some of the unfamiliarity, of course, is due to Vieques’s unusual history. The island was largely occupied by the US Navy for half a century; the former military land is now a protected wildlife refuge. What does this all mean for travelers? Pristine beaches, for one, and a blessed lack of huge resorts and condo developments. It’s the ideal setting for a hipster-friendly seaside inn. Sustainably built with native wood and curving concrete, the sculptural El Blok comprises 22 guest rooms that are divided into five categories. Each features a private terrace with ocean views, a futuristic bed — that’s an organic hybrid foam mattress with memory foam pillows, a summer-weight duvet, and 300-thread count cotton linens, if you’re counting — and sleek contemporary bathrooms with products by Aesop. Along the terraces and lounge space built around the the airy central atrium, petrified wood chairs, cushioned chaise lounges and stone benches invite you to pause for an impromptu siesta. The look — rustic-chic, with clean lines and occasional touches of color in vibrant blue tiles and indigenous weavings — is minimalist and detail-oriented. The same could be said of Chef José Enrique’s culinary offering at El Blok. Enrique, a San Juan native who was named one of Food & Wine’s Best New Chefs in 2014, is almost singlehandedly revolutionizing modern Puerto Rican cuisine. Offering Caribbean-style charcuterie boards with grilled seafood and innovative raw dishes, El Blok’s restaurant alone is worth a detour from the mainland. After indulging in tropical cocktails, go for a little dip in the rooftop plunge pool, or just walk across the street to the beach. Please note: El Blok cannot accommodate children under the age of sixteen.